Well Hello! Today is my day on this fun good neighbors pincushion party! Amanda Jean's blog was one of the very first blogs I ever followed and commented on (what seems like a bazillion years ago!) But the coolest thing was that she actually then came and visited my blog and commented on my post, and all I could think was…Geez that's super swell and nice! Quickly we became friends and a few years later we met at Quilt Market, and it was as if we were good neighbors just meeting up in Minnesota to check out some quilts. She just has this way of making you feel like you've known each other for years. And well now we have known each other for years and I'm so excited to help celebrate Amanda's new fabric line Good Neighbors with Connecting Threads! Amanda is so great at putting color and fabrics together in her many many maaaaaaaany quilts she creates so it's no surprise that her fabric line is so good together! For my pin cushion I wanted to use almost all if could in one pincushion to show off all the fabrics together! So a little string block pincushion is what I made! Next week I'll do a little tutorial on how I made it. :) Thank you Amanda for the wonderful chance to work with your fabric! I love it and its so bright and fun and well, kind of just like you! Remember to come back next week for the how to on how to make this little guy! and make sure you check out all the other pincushions as well! Also If you would like a chance to win a charm pack of this fabric please just leave a comment with someway to contact you through email thanks. For a long time I have wanted to try string piecing. Your pincushion is adorable, and I look forward to the tutorial. Adorable! I have been looking forward to this line. I love all the happy colors and prints! That is a beautiful pincushion and a beautiful story of friendship. Thanks for the uplifting day! Adorable pincushion and pretty fabric!!! Thanks for the chance to win. Looks great! I will be back! Cute pin cushion and that fabric is so adorable! Pretty scrappy pin cushion. Good way to use up little scraps. What a cheery pincushion! I'm looking forward to playing with all these bright colors. GREAT pin cushion! I like using tiny pieces. 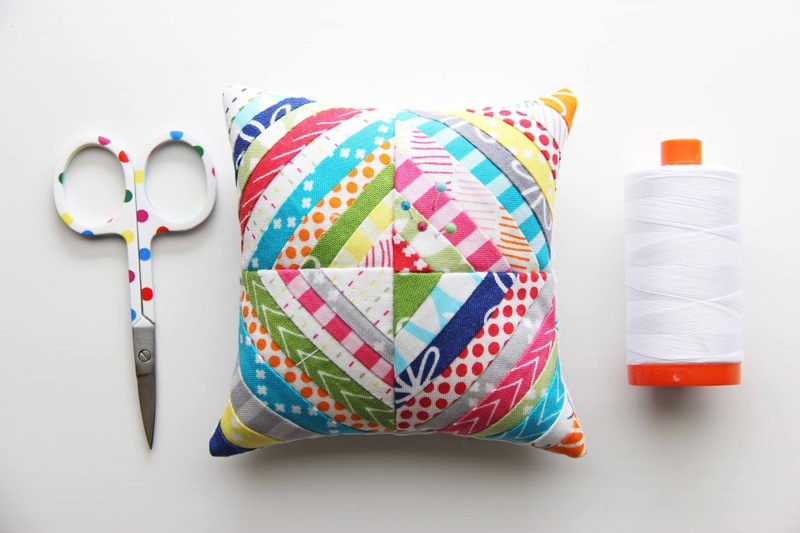 Love your little string pieced pincushion. Thanks for sharing. I love your pincushion. But I must say I love the scisors too haha :) They are perfect match! The pincushion is super cute and a great way to show off a lot of the Good Neighbors prints. They are lovely even in tiny pieces! I've got to get some of this fabric line. 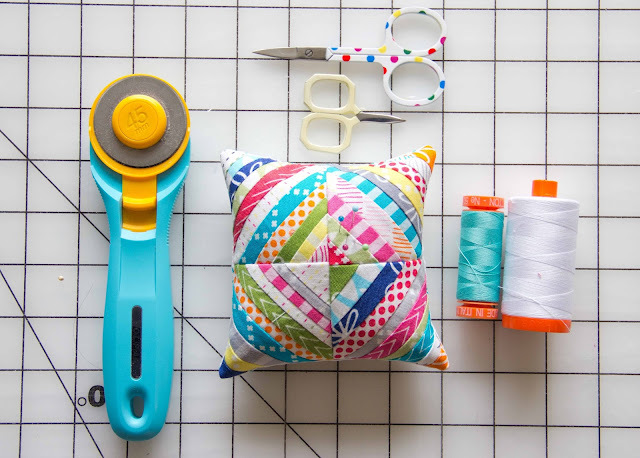 Love tutorials and the scrap pincushion is just right for a new gift project - thanks! 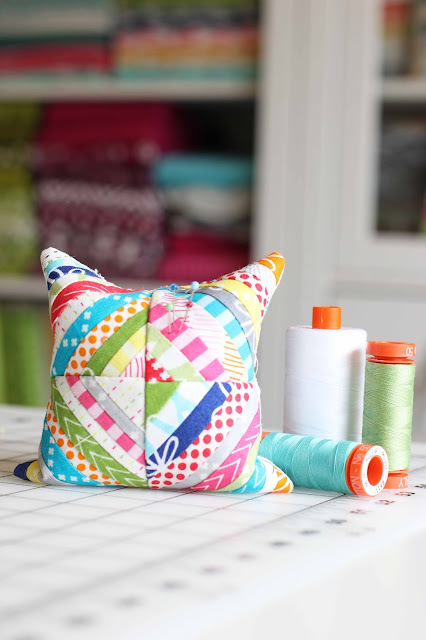 Cute pincushion - love the Good Neighbor fabric and Amanda Jean's blog. HI,neat little pincushion>Love it! Thanks for sharing +giving! Such a fun pincushion and I love getting to see so many of Amanda's great fabrics. Will look for your tutorial next week too, thanks Vanessa. Your pincushion is very sweet! And so are your styling photos! The sewing box is especially cute! Love the pincushion!!! I look forward to the tutorial next week! Each pincushion is cuter than the next on this tour! Love it. 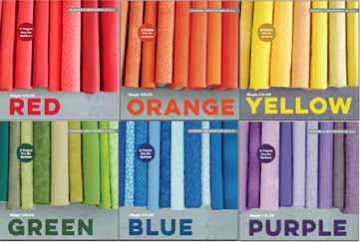 I love this new fabric line, so bright and fun! I love your fabric! I would love a charm pack! 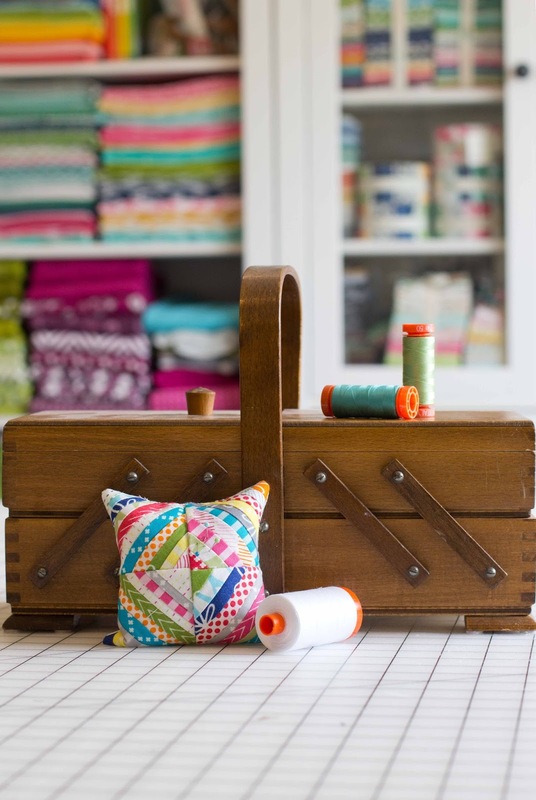 Love the fabric, love the pincushion! Adorable pincushion! I don't think I'd have the patience for something so fiddly, but I just love it! I hope I remember to come back. I love string blocks, and even tiny that looks so cute! 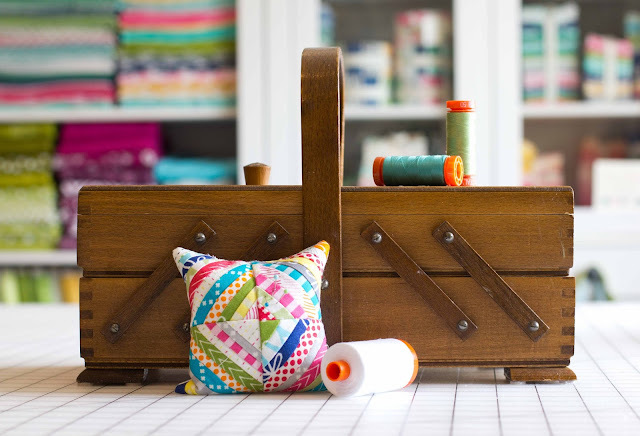 I love how you used all the fabrics in your little string pin cushion. It shows off the variety within AmandaJean's line quite nicely. This is a darling pincushion and her fabric is so sunny and happy. My old stash sure could use a dose of happy! Fingers crossed. Looking forward to seeing you made that adorable pincushion! Can't wait for the pincushion tutorial! Thank you for the opportunity to win! MichelleSeal at aol dot com. I love that you included all the fabrics. Such a fun collection! A fun and bright collection. This gave me the idea of sewing pincushions to sew for charities when I soon retire. 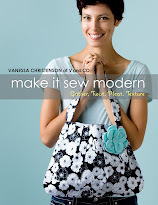 Was looking for projects to occupy my time (and an excuse for buying more fabric as I love to sew). Congrats on the fabric line! Sweet pincushion! great use of ALL the fabrics. this fabric looks so fun in every pincushion! What a bright, pretty pincushion! Looking forward to the tutorial, and thanks for the giveaway of Amanda Jean's lovely fabric! Vanessa, it's so nice to meet you! I love string blocks period...so scrappy and a great way to actually use those scraps. Your polka dot handle scissors is a great compliment to the pin cushion...such happiness, as "Good Neighbors" tends to bring out. Thanks for sharing. I love string piecing! And I love your your pincushion! It is so cute! I'm looking forward to the tutorial. The colors are so bright and cheery. I love the pincushion and look forward to your tutorial. I am really loving Good Neighbors. I guess I should put my email- magpienmom@aol.com. Too cute, I love pincushions and I love bright. Very cute pincushion. Thanks for the giveaway. All of the pincushions are so cute and each one has been different. The fabric is fabulous and the pincushion is darling! Love this little pin cushion! And love the fabric! Your pincushion is adorable. I love AmandaJean's new fabric line. I can barely wait to get my hands on some. Really cute pincushion. I'd love to win it but guess that i can make it if I have to! LOL! Looking forward to the tutorial as I don't win often. Beautiful line of fabric! Thanks for the giveaway. Wow, there are some beautiful pieces of fabric in that collection. Thanks for the giveaway. I love your little pin cushion and I want to make one. The fabric is great. What did you use for stuffing? Thanks for a chance to win a charm pack of this fun fabric. Love the new ombres.....can't wait for them to arrive. Add me to the list of folks who want to win a charm pack of Good Neighbors! The colors and designs are so pretty! I love the pin cushion! I am looking forward to making one of my own. I love your pincushion! It inspired me to look for others just as cute. I even started a new pinterest board. 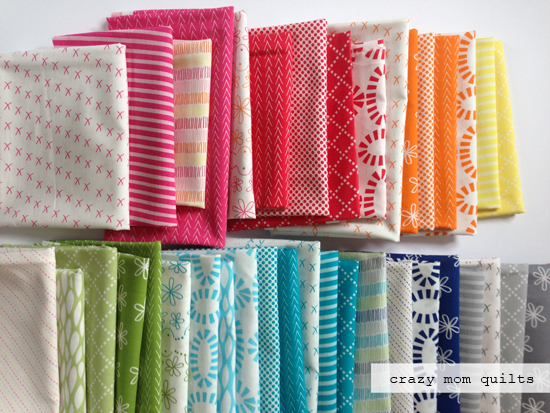 I would love to win fabrics to make one just like yours! Thanks so much! That pincushion is so pretty! After decades of sewing I still keep my pins in a bowl! I love your pincushion! I need to make one! Adorable pincushion! Love it in those fabrics. I will be back to see how you did this.. Any time I've done a miniature string block they fall apart, even with paper... Thanks so much for the giveaway chance too! This is definitely a cute project. Love the pin cushion! Loving Amada Jean's fabric line too! I love this hop! So many cute pincushoins. Oooh, can't wait for your tutorial, thanks for making one. This is a sweet pincushion made from beautiful, happy fabric! This is such a great fabric line! I will look forward to your tutorial. This would be a great way to use the many fabric scraps I have that I just can't throw away. How fun to use all those fabrics. Thanks for the upcoming tutorial. Love this pincushion. It's totally Amanda. And totally you. I'd love to win a charm pack. So cute! Love all the fabric! I love the String Quilt pin cushion! One of my favorite Quilt patterns --- so cheery in that adorable fabric! Would love to make one just like yours! Thanks! I love the string pincushion -- such tiny strips! Really sweet pincushion! So delicate! Love your pincushion! Too cute. I'll be back on Monday . . .
Love this fabric! Thanks for the opportunity to have a chance to win it! your little pin cushion is so cute. and I love those polka dot scissors too. Cute pincushion! I love the colors in Amanda's new collection. I have been crushing on this fabric! so gorgeous! 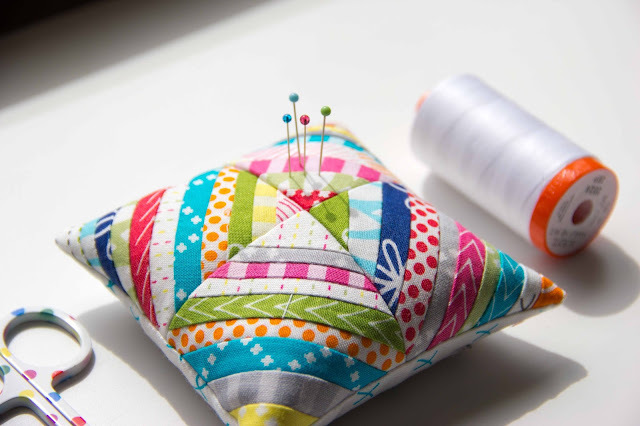 SUPER cute pincushion, and thank you for all the links to other pincushions! Cute pincushion - I love it! do the seams cause problems for some pins or do they act like a fill does and helps them stay in the cushion? Oh,I need to make one ! It is fun to see all of the fabrics together in your little pincushion. I love the fabrics. Those little strings are so tiny! Loving this pincushion. I need to make one. I don't have one. powersjlc (at) gmail (dot) com. Thank you for the chance. Oh my goodness the little strips are adorable. I love her work too and am so happy for her getting this fabric line!